A nicotine patch is a device designed to deliver nicotine through the skin and into the blood stream. It is used to help prevent the craving for nicotine that smokers experience when attempting to quit. This type of drug delivery device, generically known as a transepidermal patch, consists of a drug reservoir sandwiched between an occlusive back layer and a permeable adhesive layer that attaches to the skin. The drug slowly leaches out of the reservoir, travels through the skin, and then into the blood stream. Since skin is intended to keep most chemicals out of the body, only certain drugs have the proper chemical characteristics that allow them to be delivered in this manner. The drug molecules must be small enough to penetrate the skin's many layers. It must also be nonirritating to the skin and have a low melting point, so it can be incorporated in liquid form. Originally transepidermal delivery of drugs required they be formulated into a topically applied cream or lotion. These vehicles tend to be messy, are difficult to administer in consistent amounts, and have unpredictable absorption rates. To overcome these problems, researchers developed a method to deliver an exact dosage by mixing the drug into a bandage adhesive. This early version of the patch successfully brought a known quantity of drug to a specified area of skin for a given length of time. However, it could not control the rate at which the drug was released. In the 1950s, technology was developed to create membranes which could be used to control the diffusion rate of drugs. In the late 1960s and 1970s, advances pioneered by the Alza Corporation allowed drugs to be contained by these membranes. Thus modern controlled release patches was born. Transepidermal patches were developed to deliver precise quantities of a variety of drugs to the skin for a prolonged period of time. In early 1996 the FDA approved a patch containing nicotine for sale without a prescription. The first brand to be marketed under this new Over The Counter (OTC) regulation was Johnson & Johnson's Nicotrol®. The chemical nicotine is an addictive component of cigarettes. The body develops a physical, as well as psychological, craving for nicotine. The patch helps satisfy this craving while the smoker is attempting to quit. Nicotine is well suited for transepidermal delivery because it is a liquid which is known to penetrate skin easily. In fact, there are documented cases of tobacco workers suffering from nicotine overdose as a result of handling raw tobacco leaves, a condition known as Green Tobacco Sickness. Depending on the type of patch, the amount of nicotine compound employed varies between 5% and 50%. The drug may be used in its pure form, or it may be linked with other chemicals entities such as hydrochloride, dihydrochloride, sulfate, tartrate, bitartarate, zinc chloride, and salicylate to form derivatives. When preparing patches with these chemicals, there are two key areas of concern. The first is dosage, since too high a dose can cause irregular heartbeat, palpitations, nausea, vomiting, dizziness, or weakness. In fact, 60 mg of nicotine (the equivalent of smoking 60 cigarettes at once) is considered to be a lethal dose. Therefore, it is critical that the patch be calibrated to deliver the prescribed amount. The second consideration is related to the solvent properties of nicotine. The drug will attack or dissolve many of the materials used to make patch components. Many adhesives, for example, become stringy and loose their tackiness when exposed to nicotine. Or, they may become so heavily loaded with the drug that they deliver an unacceptably large burst of nicotine when attached to the skin. The compatibility of all patch materials that contact nicotine must be carefully evaluated. The patch itself is a small disk approximately 1 in (2.5 cm) or less in diameter, which may be assembled in several different configurations. One type of patch consists of a plastic chamber that contains the drug and is covered by a selectively permeable membrane to control the rate at which the drug is delivered. This carrier layer can be made from a variety of plastics, including polyvinyl chloride, polystyrene, polyurethane, ethylene vinyl acetate, polyester, polyolefin, and polycarbonate. Alternately, the carrier may be of the matrix type, also known as the monolith type. In this configuration, the drug is dispersed or suspended in the solid plastic matrix of the carrier. In yet another patch design, the drug is mixed directly with the adhesive and applied to a plastic support layer. Regardless of which patch design is employed, the disk must deliver the drug at a controlled rate. It is also important that the device be made from a plastic material which is flexible enough to be applied and removed from skin without breaking or tearing. All patch configurations feature an occlusive backing layer that is impermeable to the drug. This is typically a plastic sheet laminated with metallic foil to increase its barrier properties and prevent the drug from leaking. The adhesive used to mount the patch on the skin is extremely important. There are a number of medical grade, pressure-sensitive adhesives, such as acrylate ester/vinyl pyrrolidone copolymers, dimethyl silicone polymers, and acrylate polymers. The latter dominate medical adhesive market, mainly because of their low level of allergenicity. In addition to being nonirritating to the skin, a patch adhesive must have good water resistance so it continues to adhere when the skin perspires. It must have sufficiently high cohesive strength to allow clean removal of adhesive from skin, and it must have properties that allow it to accommodate skin movement without losing the bond and without excessive skin irritation. As described above, care must be taken to ensure the adhesive will not degrade after prolonged contact with nicotine. Other ingredients, such as pigments, dyes, inert fillers, and processing aids, may be mixed in with the drug. Certain types of patches also include permeation enhancers to improve drug penetration. For example, one manufacturer of transepidermal patches includes low levels of alcohol to enhance skin penetration. Some nicotine patches contain antipruritic (anti-itch) agents to treat the pruritus associated with transdermal delivery of nicotine. These antipruritic drugs are selected from a group consisting of bisabolol, oil of chamomile, chamazulene, allantoin, D-panthenol, glycyrrhetenic acid, corticosteroids, and antihistamines. polypropylene films. Polycarbonate films can be perforated by exposure to certain forms of nuclear particles. Regardless of the process, the goal is to create a thin plastic membrane with a multitude of microscopic channels through which the drug can diffuse. These membranes can be attached to the plastic housing containing the drug in subsequent operations. 2 In systems where the drug is intermingled with the patch material, like the matrix type and the mixed adhesive type, the process is somewhat different. The mixture is prepared in a special type of mixer known as a Hockenmeyer mixer. The adhesive is added first and premixed at high speeds for a predetermined period of time. Next, other additives such as viscosity control agents may be added, and further mixing occurs. Then the drug component is slowly added and the mixing speed is increased. Final adjustments in pH or viscosity may be made at this point. 3 Final processing depends on the type of carrier. Reservoir type patches must be filled with the drug mixture. The drug-adhesive matrix described above is coated onto silicone-treated polyester film. The silicone ensures the patch can be easily removed to expose the adhesive layer. The completed patch is oven dried to remove solvents and then laminated to a carrier or backing strip. This backing strip can be further processed by die cutting and then packaged as a finished product. All drugs must undergo stringent testing to ensure they are correctly synthesized and chemically pure. For drugs delivered via transepidermal patch, additional testing is necessary to determine the dosage rate of the product. This rate can be quantified by a method wherein a measured dose is applied to a sample of excised abdominal skin stretched across a small container known as a Franz-type diffusion cell. The amount of drug that diffuses through the skin sample and into the cell can be measured with a variety of analytical techniques, such as high-performance liquid chromatography. This value can be related to determine how much drug will be delivered during actual product usage. Other key tests are done to ensure the patch adheres to skin properly. Skin is a highly unstable surface which is constantly expanding and contracting. Normally, the strength of an adhesive is evaluated by applying the product to a steel plate. This method is not effective for medical adhesives, however, because these adhesives bond to skin much differently than they bond to metal. To overcome this problem, researchers use a film of collagen (a skin protein material) for peel adhesion studies. The adhesive itself may be evaluated to ensure it does not wet too easily. This is accomplished by measuring the contact angle of a drop of water on the adhesive. The water drop should not wet the adhesive, and the angle should remain for 24 hours. There are a battery of other tests for adhesives, including static shear and the Polyken tack test. It should also be noted that these adhesives fall under govermment regulations for medical devices, which require certain safety testing such as eye irritation testing and allergic reaction screening. The science of delivering nicotine and other drugs transepidermally is still evolving. Current technology can only deliver doses up to 16 hours in length, which stands to be improved. There are also opportunities for improvements to make membrane materials and adhesives that are more imperious to the solvent effects of nicotine. Furthermore, improved delivery systems that offer more advantages to the consumer should be developed. In fact, the Cygnus Corporation is developing a patch with adjustable doses, so the amount of nicotine can be varied depending upon the user's requirements. It is anticipated that recent approval to market these drugs without a prescription will result in increased market activity and improvements in many of the these areas. Satas, Donald, ed. Handbook of Pressure Sensitive Adhesives. Van Nostrand Reinhold, 1989. "Habitrol manufacturer agrees to balance information." FDA Consumer, June 1993, p. 4. 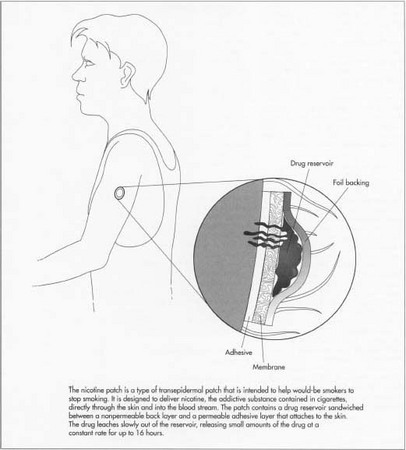 "How the nicotine patch works." Muscle & Fitness, November 1992, p 34. Starr, Cynthia. "Quitters or not, patients still like nicotine patches." Drug Topics, November 22, 1993, p. 24. I have sensitive skin I,ve used patches in the past I can not remember what brand now I,m using walgreen clear patches and have a really bad reaction to them I have three to go I do not know why this time it,s different I,ve had some redness but now it,s really itchy and annoying but I have three to go.I do not think clear patches would make much of a difference or if it,s a medicine interfering with the patch. The box says if you get a reaction you should stop the patch but I do not want to go back to smoking I do not know if I should talk to my dr or not I have a lot of health issues type 1 diabetes & such so I want to quit smoking now!!! Technically, it is not a quit smoking aid, BUT ppleoe have successfully used it to quit. My wife and best friend did it like this: First they switch to the ecig, after a few weeks, they cut back the nicotine level, after a few weeks more they cut back again. Basically they use it in steps, like you do with the patch or gum. They both said it helped more though, because it also takes care of your physical addiction of wanting to put something in your mouth. (Which made my wife very happy, because she was very worried about gaining weight when she quit).The key is to make sure you start out with the correct nicotine level to satisfy your craving, so you can stop the regular cigarettes, then you start cutting back. If you start with to low of a nicotine, you will not be satisfied and not give up the regular cigarettes.It costs the same as the patch or gum to start-around $40. My wife spent about $25 a month on refill liquid for it and it got cheaper as she used it less and less.Since there is no tar in electric cigarettes, she experienced slight coughing up of stuff . Our family doctor examined her and told her it was because her lungs were starting the healing process of purging the tar from them. It is common for ppleoe who quit smoking.Anything has to be better for you then regular cigarettes.